Secretary Locke participated in the White House launch of the “Startup America” initiative today in Washington, D.C. with U.S. Department of Energy Secretary Steven Chu, Small Business Administration Administrator Karen Mills, Director of the National Economic Council Gene Sperling, Chairman of the Council of Economic Advisors Austan Goolsbee, and a number of America’s top entrepreneurs and business leaders. “Startup America” is a national campaign to promote high-growth entrepreneurship across the country with new initiatives to help encourage private sector investment in job-creating startups and small firms, accelerate breakthrough research, and address barriers to success for entrepreneurs and small businesses. The launch follows President Obama’s State of the Union commitment to winning the future by out-innovating, out-educating, and out-building the rest of the world. To support this effort, the Department of Commerce plans to build on the success of last year’s inaugural i6 Challenge with i6 Green, a second competition this year focused on both regional economic development and environmental sustainability. The program aims to accelerate technology-led economic development in pursuit of a vibrant, innovative clean economy. 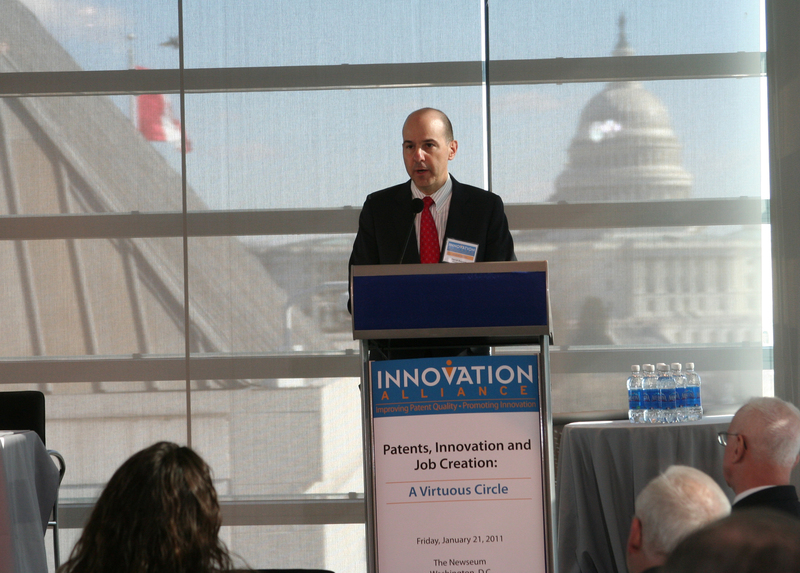 The department is also developing the Three Track program at the U.S. Patent and Trademark Office, which would give innovators more control over application processing and support a more efficient market for innovation. Today is Data Privacy Day, an annual international celebration to raise awareness and generate discussion about information privacy designated by both the U.S. Senate and U.S. House of Representatives in 2009. In honor of Data Privacy Day, here’s an update on the latest Commerce Department initiative to protect the privacy of the American people. On Jan. 7 at a discussion forum with business and academic leaders at Stanford University, Secretary of Commerce Gary Locke and White House Cybersecurity Coordinator Howard A. Schmidt unveiled plans to establish a National Program Office at the Commerce Department to help implement the National Strategy for Trusted Identities in Cyberspace, an administration initiative that aims to foster private-sector development of new technologies that can improve both the privacy and the security of sensitive online transactions. Cybercrime and identity theft cost U.S. consumers hundreds of millions of dollars annually. So the idea is that the private sector would lead the development of better technologies for consumers and businesses to establish their identities before they conduct sensitive transactions like banking, shopping or downloading health care records. The Commerce Department would facilitate the process by building consensus on standards and managing collaborative efforts with other federal agencies. 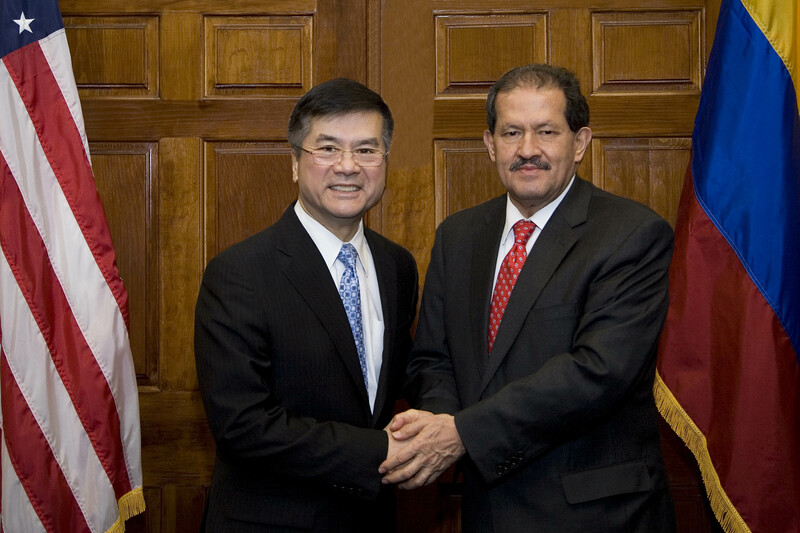 Commerce Secretary Gary Locke met today with Colombia’s Vice President Angelino Garzon to discuss various trade issues including the pending trade agreement. Locke also expressed his deepest sympathy to the Colombian people in the wake of the disastrous flooding that killed over 300 people. Yesterday, Secretary Gary Locke traveled to New Hampshire and met with regional business leaders and toured Arc Energy, a renewable energy equipment manufacturer that specializes in solid state lighting technologies. One day after President Obama delivered his State of the Union address, Locke reinforced the importance of strengthening America’s competitiveness by out-innovating, out-educating and out-building the rest of the world. He discussed how a more competitive America will help rebuild the economy, create more jobs and prepare the country for challenges ahead. Locke also discussed how the recently-passed tax cut package, which reduces the payroll tax, expands the Earned Income Tax Credit and allows businesses to temporarily expense 100% of their capital investments in 2011, benefits companies like Arc Energy. The tax cuts package provides tax relief to 800,000 people in New Hampshire and extends unemployment benefits to 12,627 residents whose benefits would have otherwise expired. Arc Energy develops cutting-edge technologies that substantially reduce the cost of LED lighting. It exports products to several countries, including China and Korea, and has signed multiple contracts worth several hundred million dollars in 2011. President Obama visited Arc one year ago and since then the manufacturer has experienced significant growth – expanding its workforce by 300 percent. Because of the industry’s expansive supply chain, for every person Arc Energy hires, roughly four to five additional jobs are created elsewhere in the United States. Today Secretary Locke wrote an op-ed posted in The Hill with a focus on how the administration and the Commerce Department are working to increase America's global competitiveness and create U.S. jobs by selling more American-made goods and services around the world. As 2011 begins, the American economy is stronger than at any time since the Great Recession began in December 2007. Retail sales just had their strongest quarterly gain since 2001. Private sector employment grew every single month in 2010, with the manufacturing sector posting its first increase in annual employment since 1997. These are strong indications that the steps President Obama took to foster economic recovery are working — beginning with the Recovery Act and continuing through the December 2010 tax-cut package. But that’s not to suggest that anyone within the administration or the Commerce Department is satisfied — not with unemployment still over 9 percent. As we move forward, policymakers should remember that the most important contest is not between Democrats and Republicans, but between America and countries around the world that are competing like never before for the jobs and industries of the future. Making the U.S. more competitive will require us to focus on two things: supercharging innovation and selling more American-made goods and services around the world, so that U.S. firms can hire more workers and reinvest in the research and development they need to keep growing. Although the private sector will take the lead on innovation, we can’t forget that the government has always had an important, supportive role to play, and the Commerce Department is engaged in a variety of areas. Secretary Locke opened a discussion with thought leaders from industry and academia today at the Commerce Department on the federal government’s role in setting, developing, using and adopting standards for critical national needs. 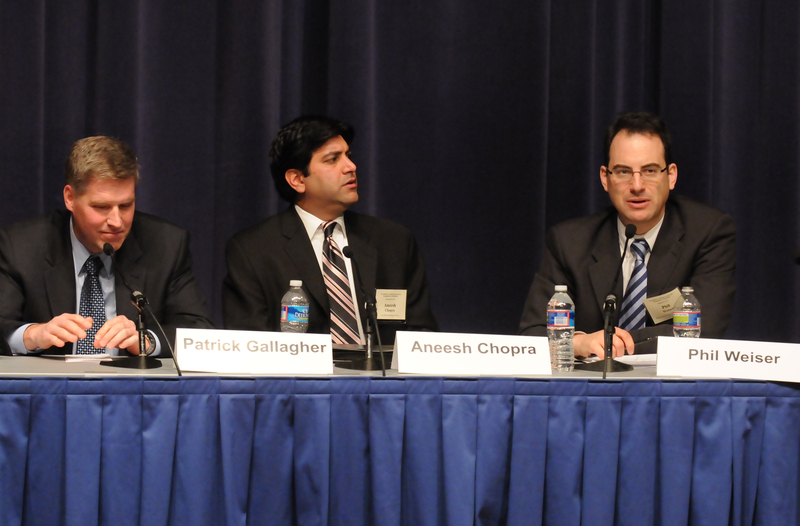 Together with the National Institute of Standards and Technology (NIST), the department hosted the panel discussion led by Phil Weiser, senior advisor on technology and innovation at the White House National Economic Council. 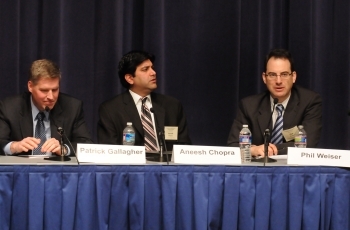 U.S. Chief Technology Officer Aneesh Chopra and NIST Director and Under Secretary of Commerce for Standards and Technology Patrick Gallagher also participated. Achieving national priorities – which include a smart grid for electricity distribution, electronic health records, cybersecurity, cloud computing and interoperable emergency communications –depends upon the existence of sound technical standards. The standards being developed through public-private partnerships for these new technology sectors are helping to drive innovation, economic growth and job creation. 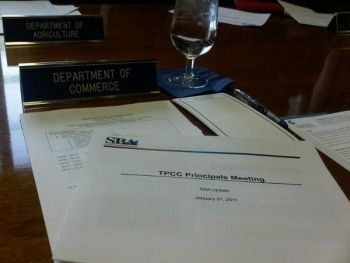 The roundtable provided key insights for the National Science and Technology Council's Sub-Committee on Standards, administered by the White House Office of Science and Technology Policy. NIST, on behalf of the subcommittee, recently published a Federal Register notice seeking input on effective federal participation in standards and conformity assessment activities related to technology. Learn more at http://www.nist.gov/el/standards_roundtable.cfm. Removing several Indian space- and defense-related companies from the Entity List. Removal from the Entity List eliminates a license requirement specific to the companies, and results in the removed companies being treated the same way as any other destination in India for export licensing purposes. Removing India from several country groups in the EAR resulting in the removal of export license requirements that were tied to India’s placement in those country groups. Adding India to a country group in the EAR that consists of members of the Missile Technology Control Regime, to recognize and communicate India's adherence to the regime, the U.S.-India strategic partnership, and India's global non-proliferation standing. . These are the first steps in implementing the export control policy initiatives announced by President Obama and Indian Prime Minister Singh on November 8, 2010. The Commerce Department’s David Kappos, Under Secretary for Intellectual Property and Director of the United States Patent and Trademark Office (USPTO), stressed intellectual property’s vital role in the innovation economy and its importance to increasing America’s global competitiveness today at a Patents, Innovation and Job Creation conference at the Newseum in Washington, D.C.
Patent-related industries make up the most dynamic parts of our economy, he said, and as a share of gross economic value, the United States invests more in intangible assets than any of its major trading partners. As our country seeks to regain the jobs lost during the recession, inventions that could spark new businesses and jobs are waiting in the USPTO’s backlog. The Harvard Business Review recently described the USPTO as “the biggest job creator you never heard of.” Reducing the time it takes to examine those applications is one of the highest priorities for Director Kappos and Commerce Secretary Gary Locke. U.S. Commerce Secretary Gary Locke delivered the opening address at the U.S.-China Economic and Trade Cooperation Forum with the Chinese Minister of Commerce, Chen Deming. The Forum is jointly hosted by the Chicago Council on Global Affairs and the China Council for the Promotion of International Trade. Representing the Obama administration for Chinese President Hu Jintao’s visit to Chicago, Locke highlighted the progress that the United States and China have made to strengthen the bilateral relationship, emphasizing the benefits of Chinese foreign direct investment in the U.S. on the American economy. He also reiterated the concerns that American business leaders continue to express about the commercial environment in China. This week the U.S. Commerce Department’s Economic Development Administration (EDA) announced a $4.4 million grant to the College of Southern Idaho (CSI) in Twin Falls to help build an Applied Technology and Innovation Center that will provide training for local technicians in wind, solar, hydro and geothermal energy; green construction; and the biofuel industry. Driving the demand for skilled employees in green energy are recent energy development projects in the region, including the construction of more than 450 wind turbines, the development of the Raft River geothermal electrical power project, and the planned installation of a 150,000 panel solar energy array. The Center will be a 29,600-square-foot, high-technology LEED certified facility located on CSI’s campus that will help CSI meet the ever-increasing demand for a trained workforce to fill the region’s jobs in alternative energy and applied industrial mechanics. The building will have green energy components such as exposed mechanical systems, measurement and verification equipment, solar photovoltaic and wind energy components, day lighting, natural ventilation, and geothermal heat. This guest column by Secretary Locke was published in the Seattle Times Friday, January 14. When Republicans vote next week to repeal the Affordable Care Act, they are voting to repeal a new level of control that American families have over their health-care decisions. They are also voting to make American businesses less competitive in the global economy. But from my perspective as U.S. Commerce secretary, one of the most important benefits of the law is that it will make American businesses more competitive by reining in rapidly increasing health-care costs. As President Obama has noted: "We are in a fierce competition among nations for the jobs and industries of the future." The Affordable Care Act will allow American businesses, large and small, to improve their performance against foreign competitors, most of whom have significantly lower health-care costs. The cost savings are real, and they will grow over time. At a luncheon today hosted by the U.S.-China Business Council, Commerce Secretary Gary Locke laid out a path to unlock the full potential of the U.S.-China commercial relationship. Locke discussed how leveling the playing field for U.S. businesses in the Chinese market will help spur global innovation and economic growth and create jobs in America. According to scientists from Commerce's National Oceanic and Atmospheric Administration (NOAA), 2010 tied with 2005 as the warmest year of the global surface temperature record, beginning in 1880. This was the 34th consecutive year with global temperatures above the 20th century average. For the contiguous United States alone, the 2010 average annual temperature was above normal, resulting in the 23rd warmest year on record. U.S. Commerce Secretary Gary Locke met today with India’s Ambassador to the United States, Meera Shankar, to discuss bilateral trade and investment issues. 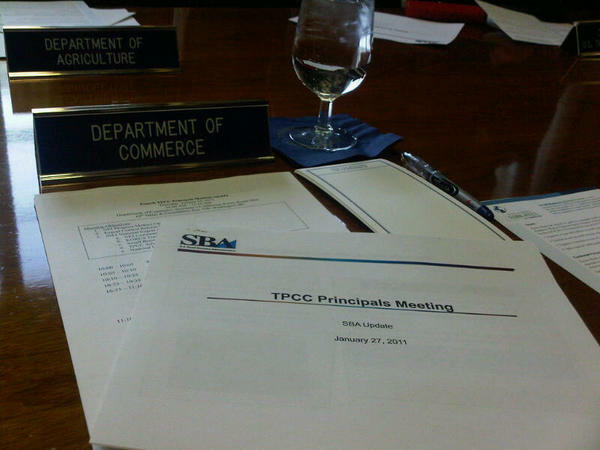 The meeting took place as Secretary Locke prepares to lead a high technology business development trade mission to India on February 6-11. Over 70 companies applied to participate in the upcoming mission, which will make stops in New Delhi, Mumbai, and Bangalore, in order to promote U.S. exports of high technology products and services in key economic sectors: civil-nuclear trade, defense and security, civil aviation, and information and communications technology. U.S. Commerce Secretary Gary Locke and White House Cybersecurity Coordinator Howard A. Schmidt are in Stanford, Calif., today at the Stanford Institute for Economic Policy Research to discuss the Obama administration’s efforts to enhance online security and privacy and next steps in meeting the challenges of a growing cyber world, with local industry and academic leaders in Silicon Valley. Commerce Secretary Gary Locke visited the Consumer Electronics Show (CES) today, where he delivered remarks on the Obama administration’s efforts to foster innovation and the President’s National Export Initiative (NEI), which seeks to double U.S. exports by 2015, supporting several million American jobs. Locke also discussed Commerce’s International Buyer Program (IBP), a key component of the Department’s export promotion effort. The IBP matches international buyers with U.S. companies that want to export. The Program recruited 34 delegations, consisting of 700 delegates from key markets such as China, Brazil, Vietnam, and Indonesia, to this year’s show – an increase of over 30 percent from the 2010 show. During the CES, Locke also visited the booths of some small- and medium-sized businesses that have increased their sales to foreign markets with the help of the Commerce Department. This week, President Obama signed the America COMPETES Act, signifying the importance of science, education and technology to America’s ability to innovate and remain competitive in the 21st century. The America COMPETES Act reauthorizes spending across the federal government on a variety of programs at agencies like the National Science Foundation, the Department of Energy and here at the Department of Commerce. The act authorizes our National Institute of Standards and Technology (NIST) to receive funding that would double its core science and technology budget by 2017, and elevates the position of the director of NIST to include the additional title of Under Secretary for Standards and Technology. It better equips our National Oceanic and Atmospheric Administration to conduct cutting-edge research and further innovation in oceanic and atmospheric technology development. And it establishes a new Regional Innovation Program to be administered by our Economic Development Administration that encourages and develops regional innovation strategies like clusters and science and research parks that help businesses grow and take advantage of regional strengths. Finally, the new legislation reaffirms the mission of our Office of Innovation and Entrepreneurship – first announced in September 2009 – which works to unleash and maximize the economic potential of new ideas by more quickly moving them from the research lab to the marketplace. 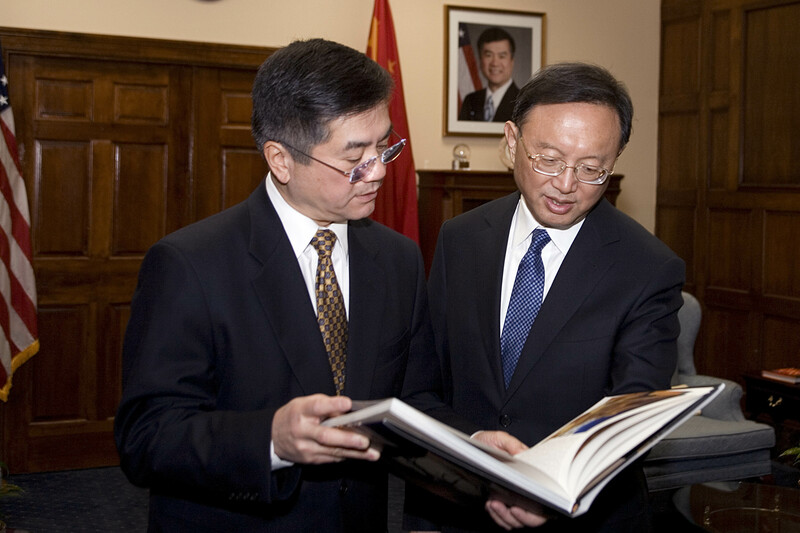 U.S. Commerce Secretary Gary Locke met today with Chinese Foreign Minister Yang Jiechi at the Commerce Department to discuss a variety of bilateral trade issues, as well as President Hu Jintao’s upcoming visit. Locke and Minister Yang had a positive meeting, discussing the U.S.-China commercial relationship, as well as the implementation of commitments made from last month’s Joint Commission on Commerce and Trade (JCCT). JCCT issues that were touched upon included beef market access, software asset management, indigenous innovation and government procurement. Locke said he looks forward to President Hu’s visit, and continuing to strengthen the U.S.-China commercial relationship. 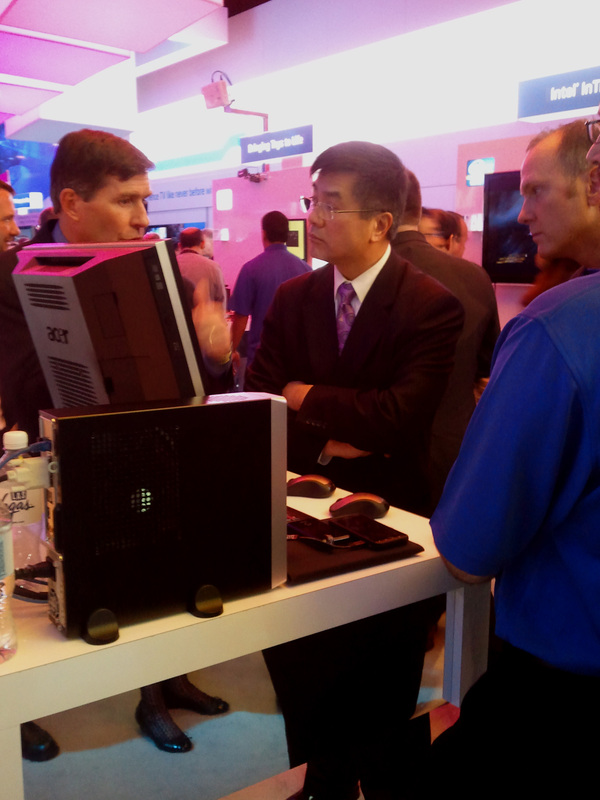 Secretary Gary Locke will visit the Consumer Electronics Show (CES) in Las Vegas Thursday where he will discuss the Obama administration’s efforts to foster innovation and the President’s National Export Initiative (NEI), which seeks to double U.S. exports by 2015, supporting several million American jobs. The Consumer Electronics Show is taking part in Commerce’s International Buyer Program – a key component in reaching President Obama’s exports goal. Jointly created by the Commerce Department and industry groups, the International Buyer Program (IBP) matches international buyers with U.S. companies that want to export. In Las Vegas, the IBP has recruited to the show's 34 delegations, consisting of 700 delegates, from key markets such as China, Brazil, Vietnam, and Indonesia – an increase of over 30 percent from the 2010 show. Here’s how it will work: Foreign trade specialists work with both the Consumer Electronics Association and Department of Commerce domestic trade specialists to identify U.S. companies exhibiting at the show whose technology is attractive to foreign buyers. 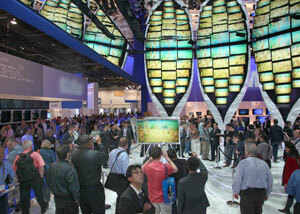 These specialists then set up meetings at the show between the buyers and American sellers. Additionally, U.S. companies will be able to meet with the foreign trade specialists to get information about doing business in markets abroad.